Richard Vance McDonald (born February 6, 1962) is an American country music singer and songwriter. 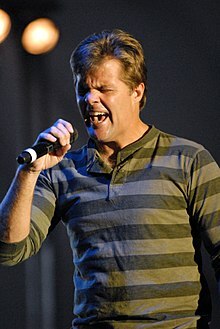 From 1998 until his departure in 2007, he was the lead singer of the group Lonestar, which recorded seven studio albums on BNA Records during his tenure as lead vocalist. For the first seven years of the band's existence, he alternated with then-bassist John Rich as vocalist. McDonald became the sole lead vocalist of Lonestar following Rich's departure. McDonald co-wrote several of the band's singles, and sang lead on all but one of them; he would rejoin the band in 2011. Outside Lonestar, he has charted twice as a guest vocalist on others' songs, in addition to releasing two independent albums and four solo singles. Richie McDonald was born on February 6, 1962, in Lubbock, Texas He founded the band Lonestar in 1992. He served as the band's lead vocalist, with other members comprising bass guitarist John Rich (who left in 1998 and was never officially replaced), drummer Keech Rainwater, keyboardist Dean Sams and guitarist Michael Britt. Lonestar signed to BNA Records in 1995, and with McDonald as lead vocalist, they released seven studio albums, a Christmas album, and a greatest hits package, and 27 chart singles. McDonald announced his departure from Lonestar in 2007, with Cody Collins succeeding him as the group's lead vocalist. On November 8, 2007, McDonald released an album of Christmas music, titled If Every Day Could Be Christmas. One of the songs on this album, "Coming Home for Christmas" (a collaboration with Jim Brickman) reached No. 4 on the Hot Adult Contemporary Tracks charts at the end of the year. McDonald released his solo debut album I Turn to You on June 3, 2008. He signed a deal with Stroudavarious Records a month later. His first single for the label, "How Do I Just Stop", was released in November, but did not chart until the week of January 17, 2009, where it debuted at number 53 on the Hot Country Songs chart and peaked at 51. A second single, "Hey God", which was originally on his I Turn to You album and before that on Lonestar's 2006 album Mountains, was released on March 3, 2009, but was withdrawn from country radio and replaced with "Six Foot Teddy Bear." McDonald released Slowdown, his second solo album, in 2010. This album included "How Do I Just Stop", which also peaked at number 51. In 2011, he reunited with Lonestar after Collins left. McDonald has sung duet or backing vocals on several artists' albums, including "Maybe He'll Notice Her Now", a single from Mindy McCready's 1996 debut Ten Thousand Angels (a song which peaked at No. 18 on the Hot Country Songs charts in early 1997), "Outside Looking In" on Kellie Coffey's 2002 debut When You Lie Next to Me, and "Havin' a Good Time" on Tommy Shane Steiner's 2002 debut Then Came the Night. He has also co-written singles for other country music artists, including "She's Always Right" by Clay Walker, "Jimmy's Got a Girlfriend" by The Wilkinsons, "Let Them Be Little" by Billy Dean (which Lonestar itself also recorded), "Coalmine" by Sara Evans, and "Once a Woman Gets a Hold of Your Heart" by Heartland. McDonald lives near Murfreesboro, Tennessee, with his wife, Lorie, and their three children. ^ "BMI results for Richard Vance McDonald". Broadcast Music Incorporated. Retrieved 13 January 2013. ^ Stambler, Irwin; Lyndon Stambler; Grelun Landon. Country Music: The Encyclopedia. p. 257. ^ Erlewine, Stephen Thomas. "Lonestar biography". Allmusic. Retrieved 12 February 2010. ^ "Lonestar reunites with McDonald". Country Standard Time. Retrieved 26 October 2011. ^ Leggett, Steve. "Richie McDonald biography". Allmusic. Retrieved 2 March 2010. ^ "Bio". Richie McDonald personal website. Retrieved 2008-03-06. ^ Wood, E. Thomas (2008-03-05). "Headline homes: Nashville's top 10 sales, February 2008". NashvillePost.com Retrieved on 2008-03-05.